At first, it sounds like a bizarre combination, but when the smartest guy in keto says that he has sardines, oysters, eggs and broccoli as his regular breakfast I wasn’t surprised to find this diet scored highly in the nutritional analysis. 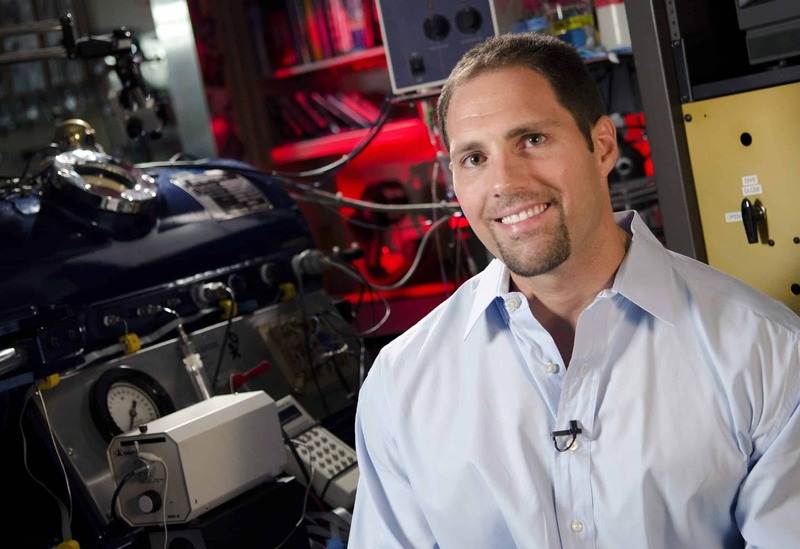 Before he started saving the world by developing Warburg’s mitochondrial theory of cancer and oxygen toxicity seizures for DARPA Dominic D’Agostino studied nutrition and is rumoured to be able to do a 500-pound deadlift for 10 reps after a week of fasting. Both physical and mental performance are undoubtedly critical to Dom, so it’s not surprising that he is very intentional about his diet and what he puts in his mouth to start each day. As you can see in the plot from Nutrition Data below Dom’s breakfast scores a very high 93 in the vitamins and minerals score and a very solid 139 in the protein score. You could say this meal was high protein (44%), low carb (10%) and moderate fat (46%), although his fatty coffee and high-fat desserts would boost the fat content to make it more “ketogenic”. I’ve heard Dom say that he aims for a ‘modified Atkins’ approach with higher protein levels rather than a classical therapeutic ketogenic diet which is harder to stick to and might be used for people with epilepsy, cancer, dementia, etc. It was intriguing to see that Dom’s standard breakfast ranks the highest in nutrient density rather than therapeutic or nutritional ketosis. But now Tim, rather than following his own slow carb approach, has made sardines and oysters a regular breakfast staple and mentions it as one of the top 25 great things he learned from podcasts guests in 2015. The stats for a 500 calorie serve of Dom’s breakfast are shown in the table below. I was aware that broccoli, eggs and sardines are nutritionally amazing, but then the oysters fill out the vitamin and mineral score to take it a little bit higher. Dom obviously understands the importance of Omega 3s which are hard to get in significant quantities from anything other than seafood. I was surprised to see that oysters can be ‘carby’ (at 23% carbs) which is apparently due to their glucose pouch which varies in size depending on when they’re harvested. If you wanted to skip the oysters due to taste or cost considerations, the combination of sardines, egg and broccoli still does pretty well. This option gives fewer carbs, a slight decrease in the vitamin and mineral score with a small increase in the amino acid score. The combination of nutrient-dense seafood with nutrient dense vegetables is hard to beat. The chart below shows my comparison of the nutrients in the various food groups in terms the proportion of the Daily Recommended Intake (DRI) from 2000 calories (click to enlarge). I couldn’t get any photos of Dom’s breakfast, but I did get a picture of my current go to lunch. Each weekend I get a bunch of quality celery and chop it up into tubs to take to work each day. I have cans of mackerel and sardines in my drawer at work. Celery does really well in terms of nutrient density per calorie and sardines and mackerel are high on the nutrient density lists without being outrageously expensive (e.g. caviar, anchovy, swordfish, trout). When I feel hungry, I might start munching on the celery which is pretty filling and hard to binge on. Then if I’m still hungry, I’ll have as many cans of mackerel or sardines as it takes to fill me up (which is usually 2 to 4). At around 2 pm this is my first meal of the day (other than espresso shots with cream) at around 2 pm. If I start to feel hungry before then I might check my blood glucose to see if I really need to refuel or if I think I’m hungry because I’m bored. I’ll then go home and have an early dinner with the family around 6 pm. I’ve been known to indulge in some peanut butter with, cream, Greek yoghurt or even butter if I’m still hungry (e.g. if I’ve ridden to work) but I try to not overdo it as I’m not as shredded as Dom yet. The simple combination of celery and mackerel also does pretty well in the ranking of 250 meals and aligns well with my current goal of maximising nutrient density and ongoing weight loss now that I’ve been able to stabilise my blood glucose levels. Okay, you lost me now. My lunch time version is sardines and avocado. That’s one tin of sardines not 2 to 4 Marty;-)! I think combined with one avocado, the macros are more ‘keto’ than several tins of sardines as they are quite rich in proteins. Another classic is celery with egg mayo with a little shredded cheese. I scoop the dip with the celery stick, it’s really tasty. Homemade guacamole and cucumber is also nice and full of anti-oxydants. I think mussels are roughly equivalent on “nutrient density” to oysters, and are generally only 1/10th the price. I have something similar to your snack, Marty–I take sardines and hard-boiled eggs, mash them together with a little Primal Mayo, then dip celery sticks into it. The sardine/egg/mayo mix also goes down well (according to my meter) when slathered all over the top of an avocado half, and eaten with a spoon. My husband likes to take individual sardines and roll them up in Swiss cheese slices. If he could do eggs, I’m sure he;d work them in somewhere. I like the sounds of your lunches, I never thought of sardine eggs combo 🙂 Or rolling sardines in cheese slices. My boyfriend can’t do eggs either so I’ll suggest that to him :-). I thought Dom said in a recent podcast that he skips breakfast (and lunch). No he does breakfast, fatty coffee through the day and hen has dinner. Hello Marty, I would like to know what kind of food you think is best for mankind and the planet in a long term perspective? I thought I had a strong stomach, but breakfast is not the best for me. How exactly does everyone prep these oysters and sardines? Or just eat them strait out the can? I tried my first can this morning (Crown Price smoked in olive oil) on arriving to work, after a workout. Taste was OK, texture was better than expected but still grossed me out. Something about the olive oil and smokey flavor through me off, I only got two down. How do you scarf down gelatinous seafood first thing in the morning? Are the boiled versions or lemon flavored any less gross? I prefer the sardines or mackerel. I thinks Dom has nutrition and physique prioritized over taste or cost. You take two or three pastured eggs, and scramble them in with a little MCT oil so it won’t stick to the pan. Add 1/2 can of oysters and 1 can of sardines, and make just like regular scrambled eggs. Sometimes I’ll add some tomatoes and onions. Then add 1/2 package of frozen organic broccoli florets. Double everything if cooking for two. I’m not sure why it sounds gross to you, but it’s really delicious, just like having some breakfast sausage scrambled in with your eggs. From eating sardines straight out of the can vs.cooking them with eggs and veggies, the taste is more tolerable cooked. So does cooking change any of the nutrient potency? Does Dom eat his straight out of the can? Thanks. You can cook with MTC oil???? I’m confused. The post says broccoli, but broccoli rabe is what’s entered into the nutrition data plot. So which is it: broccoli or broccoli rabe? I heard Joe Rogan worry anout sardines after a blood test tevealed high arsenic levels on his blood due to them. I heard a similar anecdote from Tony Robbins on the Tim Ferris Show. General consensus seems to be that focusing on smaller fish like sardines is a good idea. Also probably good to get quality fish and a variety. Omega 3s are important and seem to be quite hard to get other than fish though. Hi Jonathan, I think Joe was talking about high mercury levels, not high arsenic levels. Arsenic is more likely to come from an item in the soil, than from seafood. But sardines are very low on the food chain, so it seems unlikely to me that they would be all that high in mercury. He does say he drinks wine; wine is a product that could easily be high in arsenic, even if it’s from organic grapes. So if he was talking about arsenic, that could also be the source. So, I just watched the podcast. Joe said his “nutritionist” was adamant that the arsenic was coming from sardines. Dom replied (twice) that the arsenic was far more likely to be coming from plants and soil, and added that the kind of sardines he uses, from Wild Planet, are highly recommended. To me, it’s almost unbelievable that sardines, a wild species caught in the ocean, which are very low on the food chain, would be high in arsenic. Joe’s nutritionist was very likely wrong. There is of course pollution in the ocean, but arsenic tends to be a soil pollution, not ocean pollution, problem, on the scale that would affect small fish like sardines. Hi Deb, it’s funny you mention this now as I happened to be looking into this again this week. I am sure he said arsenic. It was an aside that he had blood work done and had high arsenic which is why he gave up sardines which he didn’t know contained it. Let me know if I was wrong though… would be pleased to be wrong on this one as apart from that, tinned sardines and mackerel seem easy quick healthy meals. Hi Jonathan! I listened again, and you’re right… he did say arsenic… which is very odd, because arsenic is generally not a problem in sardines. Dom answered that he always uses Wild Planet sardines, and recommends them, and that his understanding was that arsenic would more likely come from plants grown in soil, than from seafood, especially a deep sea product like sardines. So – yes, the nutritionist did say that – but in my opinion, Dom is right and the nutritionist is simply mistaken. Nutritionists sometimes make silly statements…. I suspect this is one of those times.